The rest of the state is finding out that Catholic League baseball might be unbeatable. 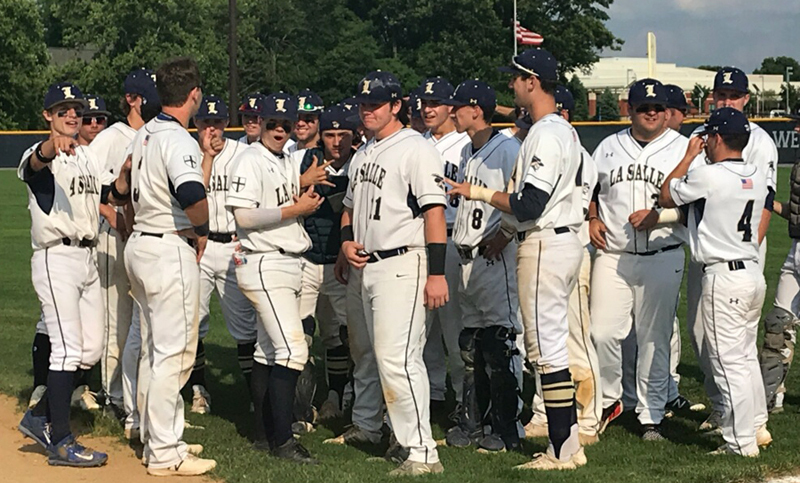 Two PIAA quarterfinals occurred simultaneously Thursday afternoon, June 7, and thanks to social media tools such as Twitter, the communities of La Salle and Archbishop Carroll could compare notes and discover that both of their baseball teams were overwhelming their opponent. In a Class 6A contest at Manheim Township High School in Lancaster, La Salle scored nine runs in the first inning and coasted to a five-inning, 13-0 victory over Red Lion. In a Class 5A battle about 35 miles away at Muhlenberg Middle School, Carroll scored one in the first and five in the second before cementing a 7-2 win over Cedar Cliff. On Monday, La Salle will meet District 1 champ Bensalem in a Class 6A semifinal. Carroll will face District 3 third-seed Lower Dauphin. Neither site has been announced. Moretski tossed four shutout innings before giving way to senior Dan Karrash for the final frame. When he took the mound in the second inning, Moretski had an enormous cushion thanks to nine runs, all of which occurred with two outs. Senior Brian Schaub started the onslaught by mashing a two-run homer over the left-field fence. An RBI single by junior Owen Lawn and a two-run single by senior Joe Sortino made it 5-0. Senior lead-off hitter Eric Marasheski’s second at bat of the inning was a two-run triple to increase the lead to 7-0, and when senior Andrew Cossetti belted a two-run homer off the scoreboard in left-center, La Salle coach Kyle Werman knew he would have a rare opportunity to spot most of his bench players some increased playing time. Werman lauded Schaub for working back from a 1-2 count to force a 3-2 pitch that he was able to launch to begin the offensive avalanche. For Archbishop Carroll, the Patriots took advantage of a disastrous two innings by Cedar Cliff that included four balks and an error. Junior Tyler Kehoe started the scoring when he walked, moved to second on a double and scored on a balk. In the second inning, the Patriots loaded the bases on two walks and an error. One out later, Kehoe (3 for 4, two doubles, one walk, two runs scored, three RBI) slammed a three-run double. Sophomore Max Hitman then singled home Kehoe, and senior Jake Kelchner singled home the sixth run. Carroll junior pitcher Alex Cornell was in total command of the game through the first out of the seventh before tiring.